There have been many Pokémon movies before, but none have been live-action (well, mostly live-action) before. That’s all set to change with Detective Pikachu, which puts a super-sleuth spin on proceedings by taking inspiration from the 2016 3DS game of the same name. Ryan Reynolds voices the titular yellow creature, and he has more to say than just “Pika! 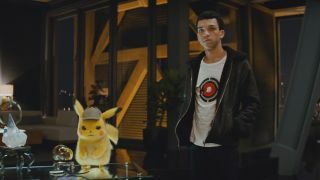 Pika!” as the film pits him in an odd couple dynamic with Jurassic World: Fallen Kingdom’s Justice Smith, who plays former Pokémon trainer, Tim Goodman. Tim can understand Pikachu unlike anyone else, and hears the sassy tones of Ryan Reynolds where everyone else hears (admittedly adorable) squeaking. As Letterman goes on to tell TF, he wasn’t a Pokémon fan himself, but his kids convinced him that he had to take this directing gig. “I kind of didn’t have much choice!” he laughs. The film is set to fall somewhere between the Who Framed Roger Rabbit and Blade Runner, given the fusion of the cute animation within a live-action neo-noir backdrop. Pokémon: Detective Pikachu opens in the US and UK on May 10, 2019, and you can read much more about it in the latest issue of Total Film magazine, which hits shelves this Friday, April 5. It’s a huge Avengers: Endgame special, and features loads more including Toy Story 4, Olivia Wilde, Men in Black: International and Rocketman to name a few. Check it out!